It’s hard to believe the third and fourth week of travel is finished already! It was extra busy during the third week, as Yates traveled to four cities in a row instead of just three. On Monday, October 22nd, we kicked off the week in Charlotte, NC. Then we headed to Jacksonville, Florida on Tuesday and Winter Park, Florida on Wednesday. The final stop for the week was Charleston, South Carolina. To start off the next week, we got to travel to Nashville, Tennessee on Monday. Meeting new families and catching up with old alumni and campers is one of the best parts of camp’s “off season,” and we really enjoyed getting to share this week of travel with you all. Monday’s show in Charlotte, NC was special for Yates because it is his hometown. Kelly and Patrick Ridinger graciously hosted the Falling Creek Camp Movies & Reunion at their home. 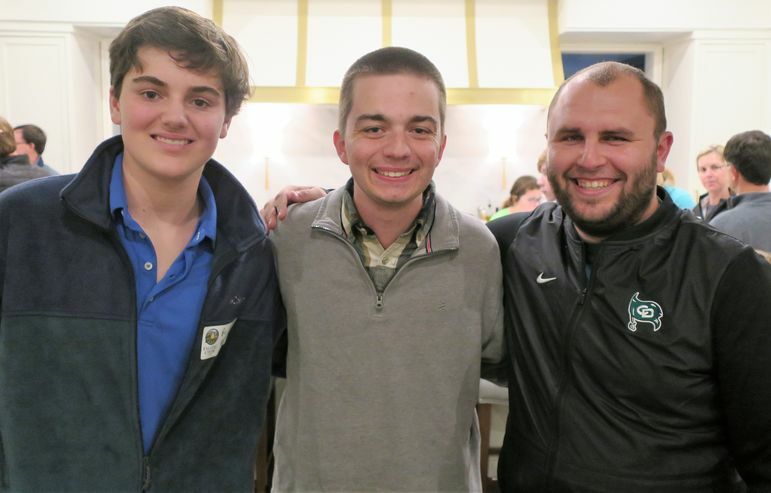 Charlotte remains a huge "camp town,” and many current Charlotte campers also have fathers who are Falling Creek alumni. It’s exciting to see camp get passed from generation to generation, where fathers and sons can have that extra bond that comes from sharing the camp experience. Paul Leonard lives in Charlotte, and was a Falling Creek camper in the late 70’s through the early 80’s. He came with his son Matthew, and we enjoyed having them to help tell everyone stories about their experiences and what makes them continue to come back to Falling Creek. 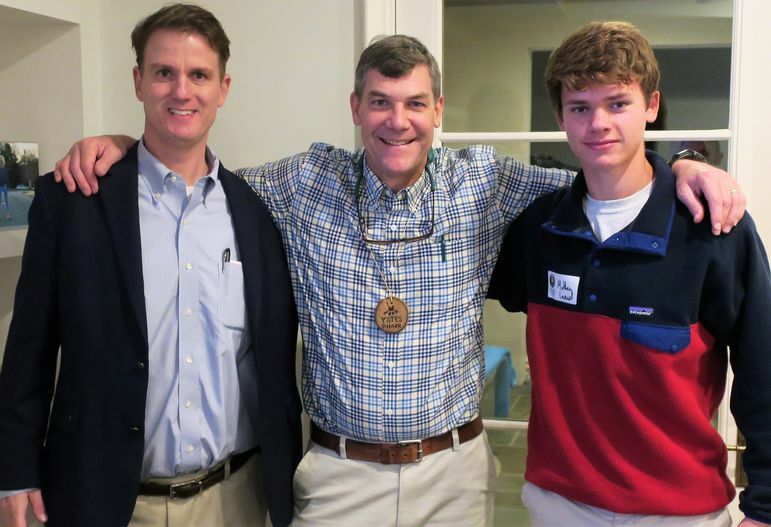 FCC alumnus Paul Leonard (left) and his son Matthew reconnect with Yates and other FCC families. Mike Nuckles and Andrew Josupait are two all-star recent alums. Nuckles worked at FCC from 2009-2016, and Andrew was here in 2015 and 2017. They have also both worked recent Father/Son Weekends, and took the time to come and support Falling Creek at the Charlotte movie show and reunion. It was great to catch up with them, and they are doing big things. 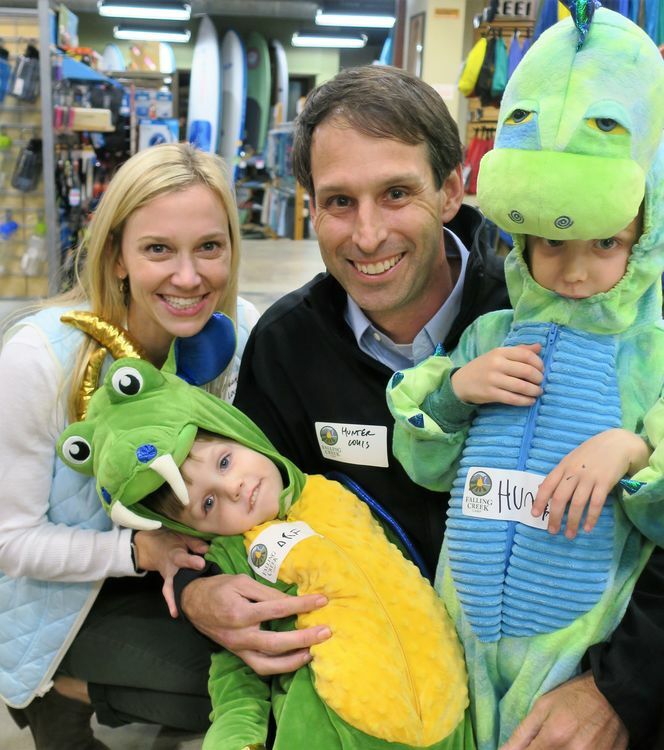 Nuckles is the assistant athletic director at Charlotte Country Day School, which also happens to be Yates’ alma mater. Andrew will be graduating in December from UNCC with an engineering degree. Thanks also to Cannon Ridinger for sharing his home and helping Yates with the presentation. 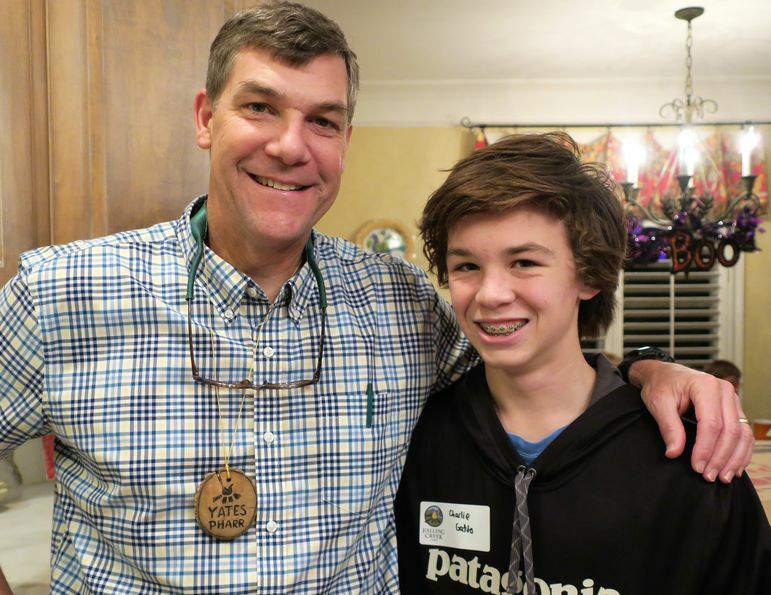 We are excited that Cannon will be coming to Main Camp in 2019, where he can expand his passion for whitewater paddling! 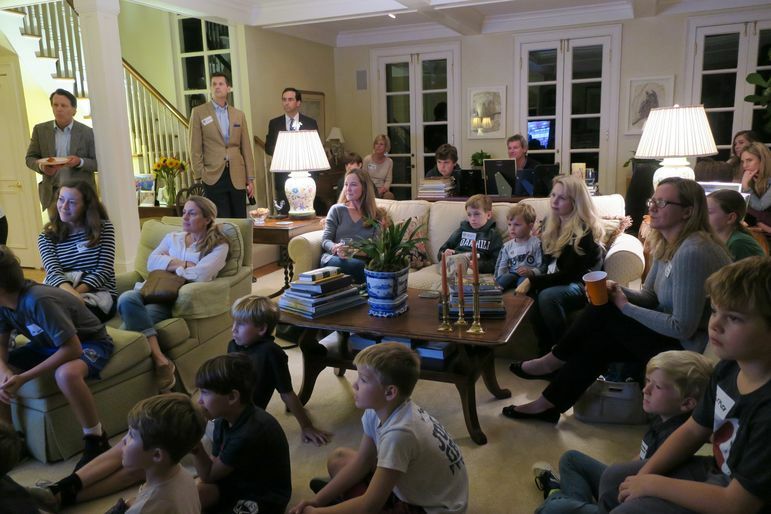 Great turn-out at the Ridinger's home in Charlotte! 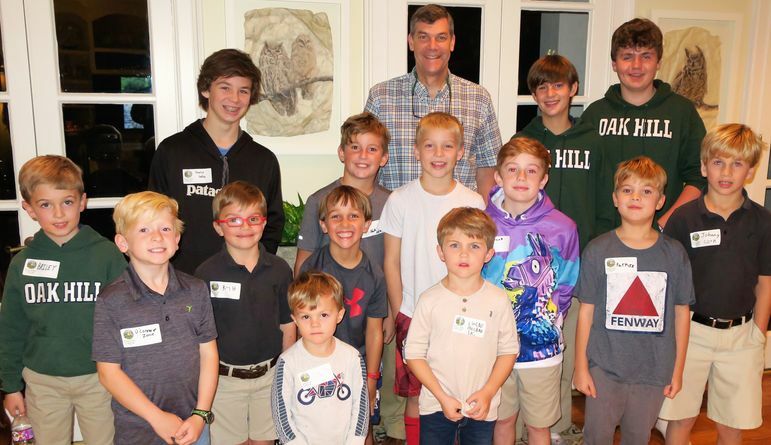 The Dads who attended Father/Son Weekend joined FCC alumni, staff, and the boys for a photo of the big turnout at the Ridinger's home. 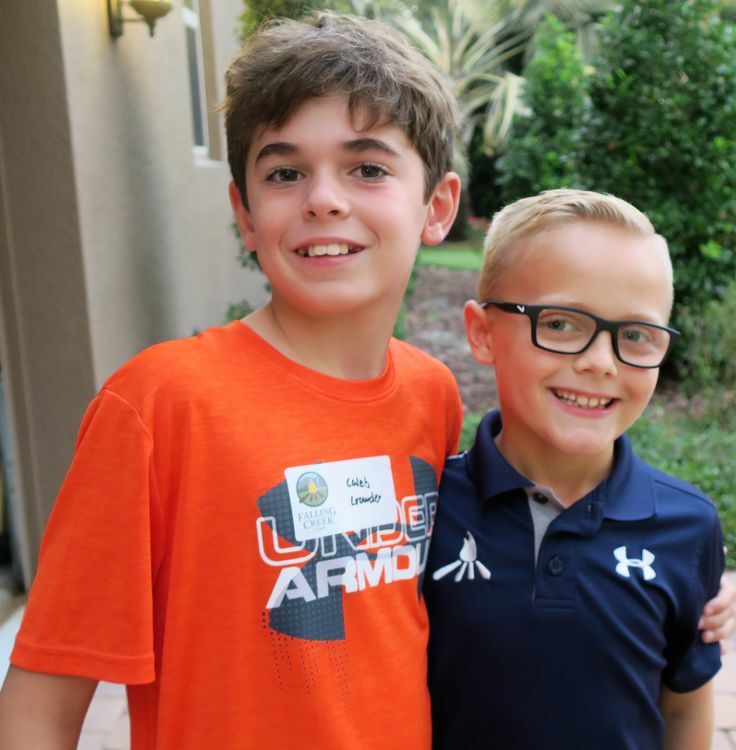 5-year camper, Roy R (left) and 6-year camper Mason S enjoyed reconnecting, and they are exciting to be returning to June camp in 2019. On Tuesday, we headed down south to visit our camp families in Florida. Though we’re breaking out the sweaters and watching the leaves change color already at camp, it was nice and warm in Florida still. Jacksonville was the first stop in Florida for the Falling Creek Camp movie and reunion tour. Thanks to Raymur and Phil Rachels for hosting the big event again at their home. It was great to reconnect with a number of veteran campers, including Richard Nichols, Hill Jenkins, Gunnar Davidson, and Jack Valentino. All of them have been to camp for more than 5 summers each, so they were the perfect crew to tell the new families about their Falling Creek experiences. 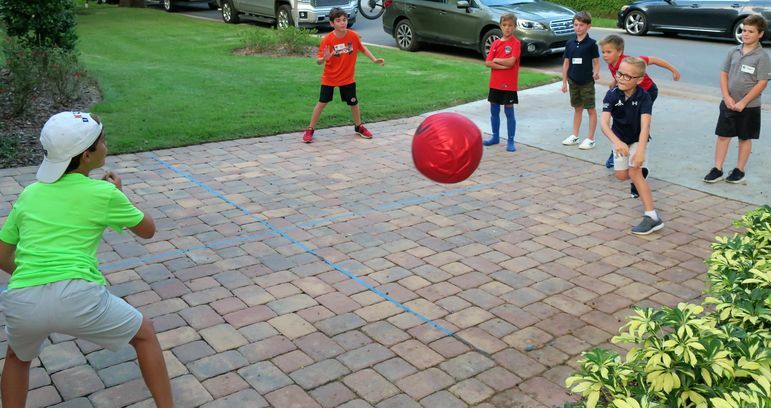 From Jacksonville, we headed farther South down Florida to Winter Park, where Laura and Brett Lawton hosted the Falling Creek Camp movies and reunion for the Orlando area. 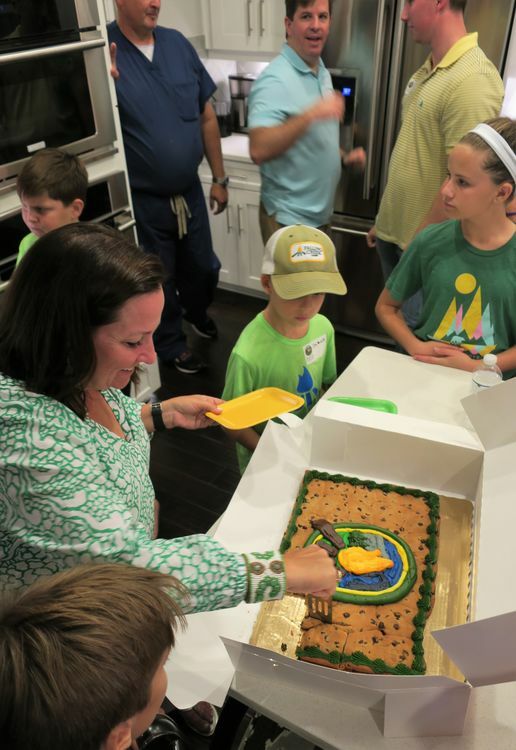 Laura presented a beautiful Falling Creek cookie cake, which was a huge hit. Laura's famous FCC cookie cake! 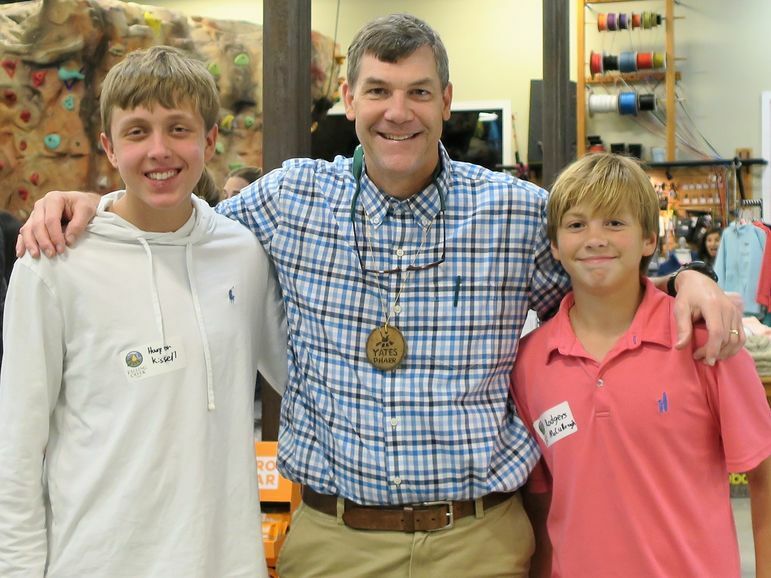 Their son Jack was a big help by answering many of the questions for parents and boys who have not been to camp yet. We are excited that he will be coming to his first Main Camp session this summer! There were several other veteran campers who helped Yates as well. 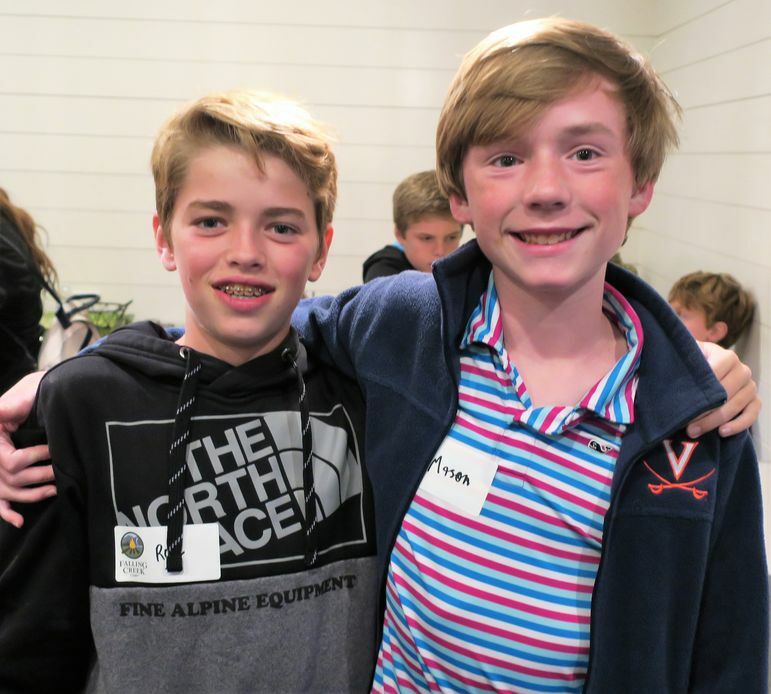 We love having current campers and alumni at these reunions because not only is it fun to catch up, but it is always nice to have returning campers share their Falling Creek experiences so new parents can hear from them directly. 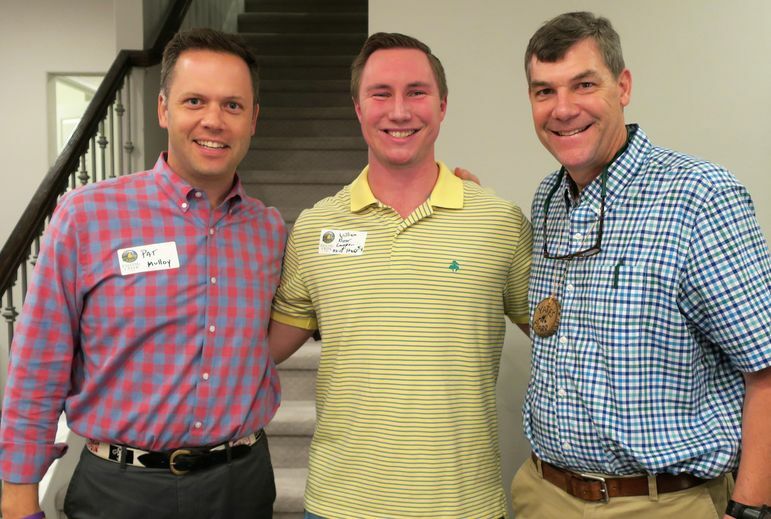 It was wonderful to reconnect with William Boor, a long time Falling Creek alum from Atlanta. 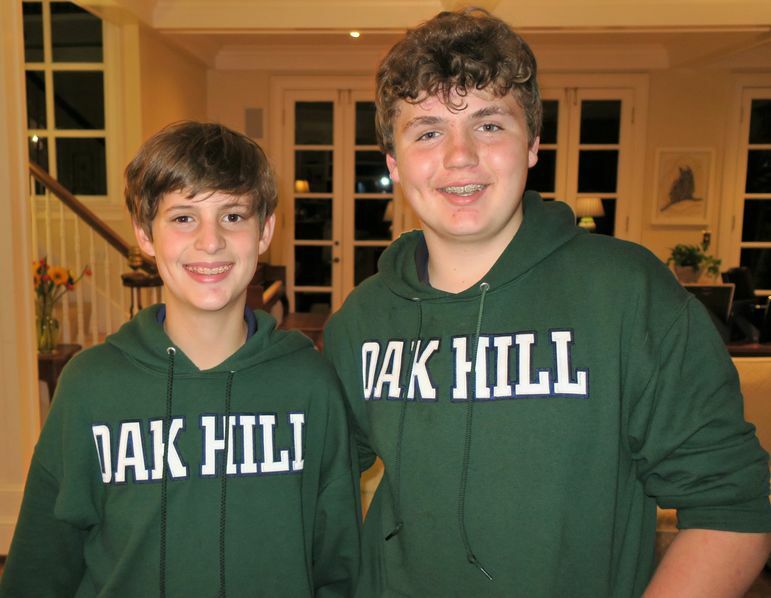 Will was a camper from 2002 – 2011, a CIT in 2013, and a counselor in 2015 and 2016. He works in the insurance business in Orlando now and took the time to come by and support FCC. 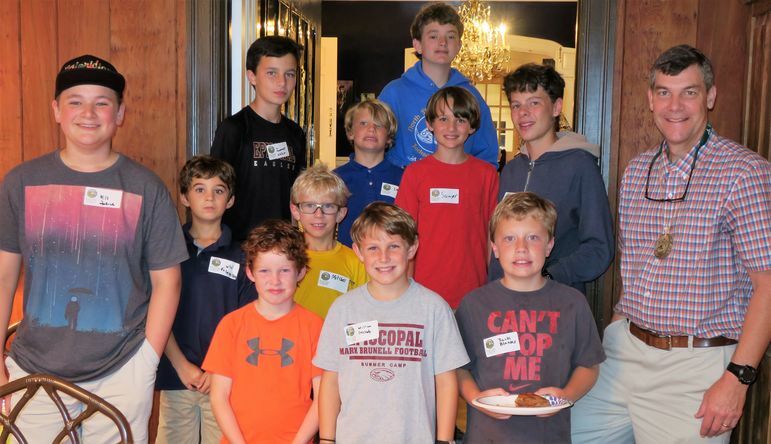 Everyone enjoyed hearing about his camp experiences, including his accomplishments of Warrior in Blacksmithing and Ranger in Ultimate Frisbee. 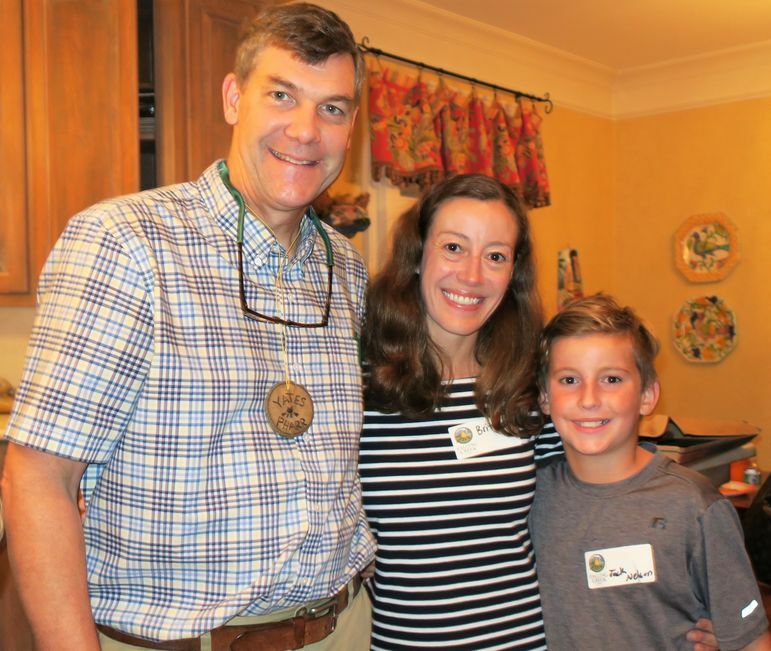 Alumni Pat Malloy was a Falling Creek camper in the late 80’s and early 90’s, and is now the upper school principal at the nearby Trinity Preparatory School. We can’t wait to see his boys, Wip and Duncan, at the 2-Week session this summer. Having a ball at the movie show and reunion in Winter Park, FL! Catching up with camp friends in Winter Park! From Florida, we headed back North on Thursday and stopped in Charleston, SC with the FCC families in the area. 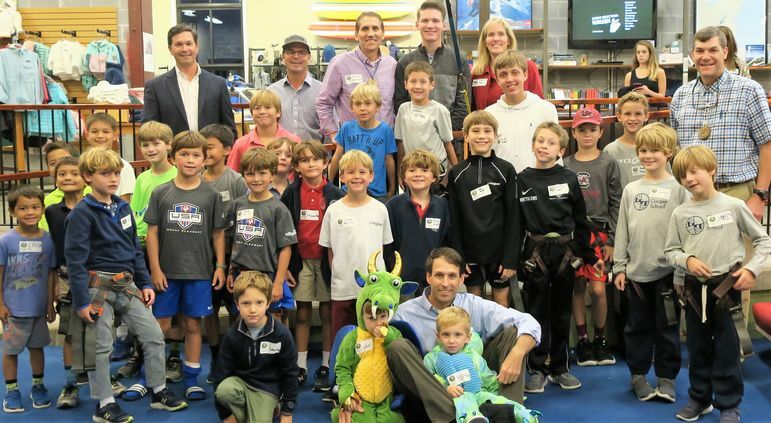 Many thanks to Beezer & Emily Molten for having us in their huge Half-Moon Outfitters store, which was a fun setting to host the event. Also a big thank you to Catherine and Clay McCullough for coordinating the yummy pizza and refreshments. 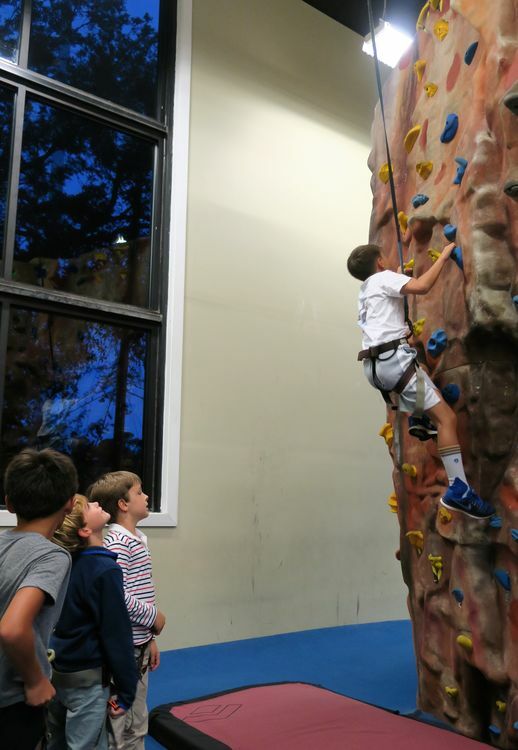 The boys loved having the opportunity to climb on the two large rock walls in the store while seeing their camp friends. Having two indoor rock walls at the Charleston show was awesome! It was great reconnecting with Steven & Cindi Feingold and one of their sons, Sam. 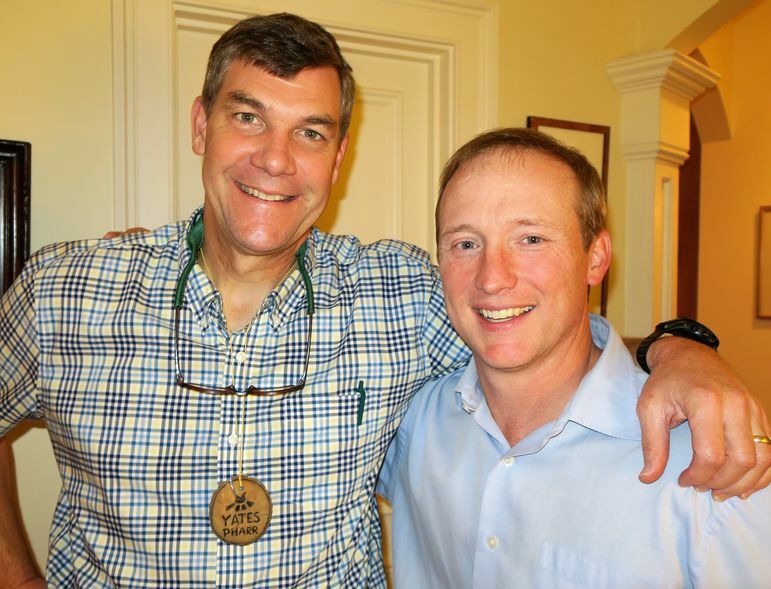 The Feingold family has been an important part of the camp community as a long-time camp doctor family. 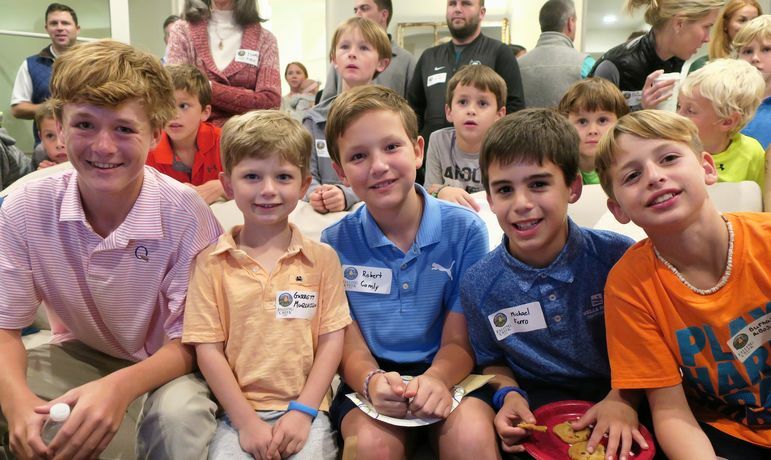 We are happy they’ll be returning to Falling Creek in 2019 for their 10th summer serving as one of our weekly camp doctor families. Hunter Louis, an FCC camper in the 90’s, also brought his two boys to the movie show and reunion. Hunter and his oldest son will be attending the August Father/Son Weekend this summer. We are also excited that the entire family will be serving as a camp doctor family during a week of the 2-week session. FCC alumni Hunter Louis with his family. Hunter will bring his family in 2019 to serve as the physician for a week during the 2-week session. Chip Shealy, also an FCC alumni, brought his two boys, Jackson and Whit. Jackson will be returning for his 4th summer in 2019, but it will be his first time at the June Camp session. His brother Whit is headed to Junior camp. 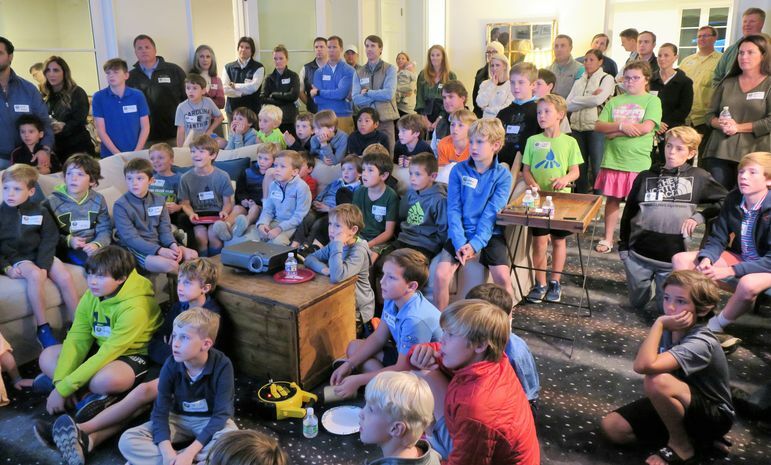 10-year camper Harper Kissell and 7-year camper Rodgers McCullough were also able to make it to the reunion and movie show. They teamed up with a number of other veteran campers to help tell their Falling Creek stories to all of the new families who came to learn more about camp. 10-year FCC camper Harper Kissell (left) and 7-year FCC camper Rodgers McCullough. The great crew in Charleston, SC! On Monday after the weekend, we traveled to Nashville, Tennessee on October 29th. It was a great way to start off the week, and a big thanks to Elizabeth and Les Coble for hosting the event at their home. Their son Daviss will be returning to camp in 2019 for his third summer, this time at the Main camp session. Thanks also to Shae and Jim Uden, who served as co-hosts. 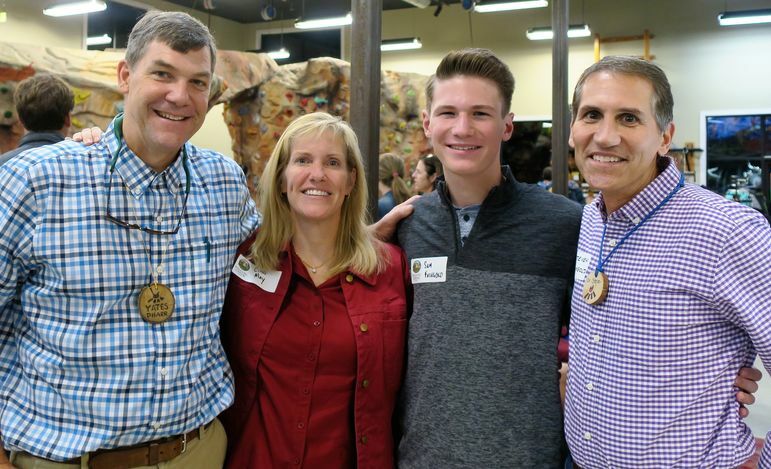 Jim Uden was a camper and counselor at FCC when Yates was also a counselor, and now his son Whit will be returning for his second summer at the June camp session. Camp nurse Brittany Nelson and her son Jack also came to support, and they will both be back at June camp this summer. Camp nurse Brittany Nelson and her son Jack- they will both be back at June camp this summer! There was a great group of returning campers who helped Yates explain the Falling Creek experience to those new families who came. 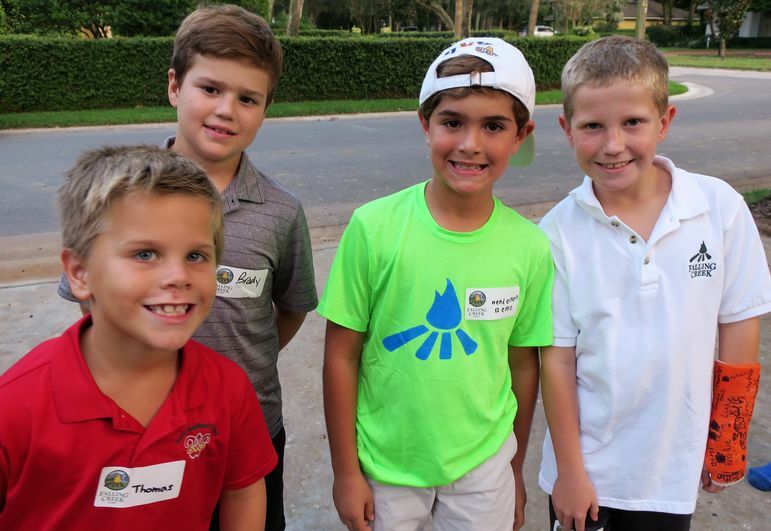 Charlie Gatto, Jack Nelson, and Drew Bennett were among those returning campers who helped answer questions and share stories. Great seeing everyone in Nashville! 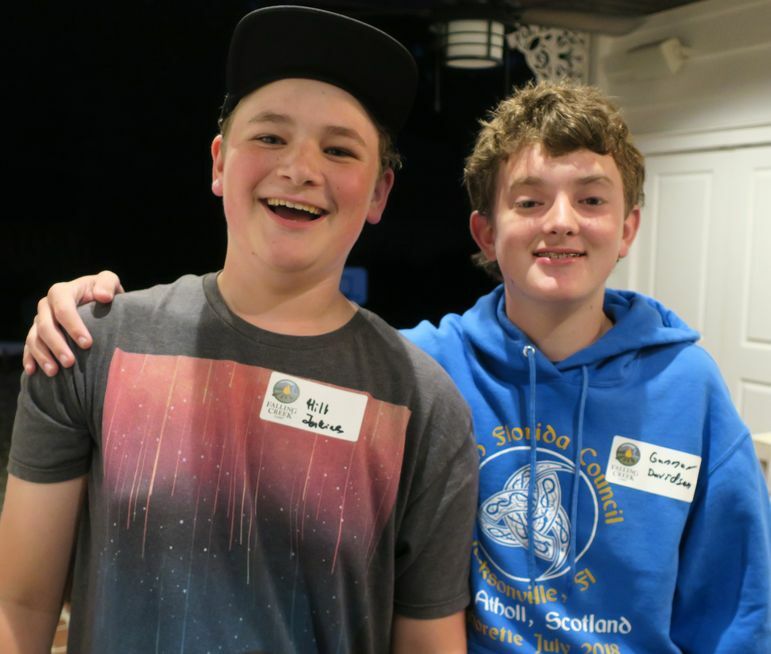 Daviss and Cole - can't wait to see you both again this summer! Thanks again to all of the families who took time out of their busy schedules to catch up with us. Next week we’re headed to Texas and New York! Come join us in Houston on Monday, November 5th, Dallas on Tuesday, November 6th, and Bronxville on Wednesday, November 6th. Just one more week of travel left, plus our live-streamed show in Asheville on November 14th! Can’t wait to see you soon.